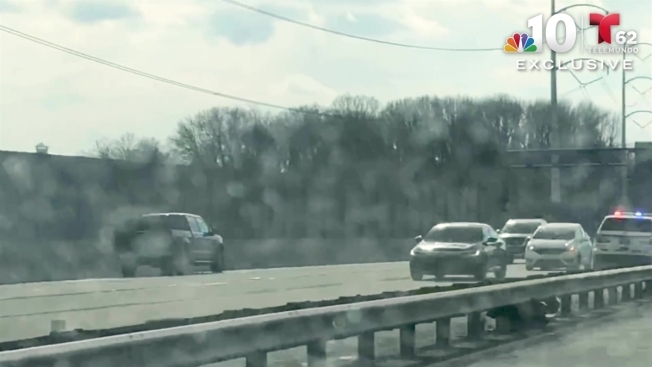 A video, obtained by NBC10, shows the vehicle speeding down the busy highway in the opposite direction. A pickup truck sped the wrong-way down Interstate 95 in Delaware County, Pennsylvania, on Monday before crashing the vehicle. The chase and crash was caught on video by a passerby. A wild, caught on cam police chase came to a violent end when a suspected DUI driver speeding the wrong way down I-95 slammed into a car and flipped over. The chaotic ordeal began around 3 p.m. Monday outside Philadelphia International Airport when a man inside a black Ford F-150 was stopped in the running lanes of Departures Road outside a terminal, police said. When police blew their horn, the driver of the Ford, later identified as Anthony Colabove, 41, of Wayne, allegedly took off and jumped the median, striking two vehicles. "Just as we got to the Terminal A area, we got slammed in the back out of nowhere," Hayley Albright, who was inside one of the vehicles, told NBC10. Colabove continued driving southbound on I-95 in the northbound lanes, according to investigators. A video, obtained by NBC10, shows the F-150 speeding the wrong way down the busy highway as police vehicles chase after it. The video then shows the pickup truck colliding head-on with a silver, 2019 Hyundai Genesis near Rt. 420. The impact caused the pickup truck to flip over. "My head turned and I see the front grill of the car coming at me," Colin Miller, the driver of the Genesis, told NBC10. Miller, 19, of Glenolden, miraculously walked away from the crash uninjured. "I think it's surreal," Miller said. "I'm sure it'll hit me later." Miller told NBC10 he was test driving the Hyundai at the time of the crash. "I'm happy that I'm alright and it didn't happen to anyone else," he said. Colabove was taken into custody and then the hospital in stable condition. He's charged with DUI-drug and drug possession. No one else was seriously injured. Colabove has been accused of driving in the wrong direction before, according to court records. He pleaded guilty to driving under the influence in 2003 and for harassment and making terroristic threats in 2017.